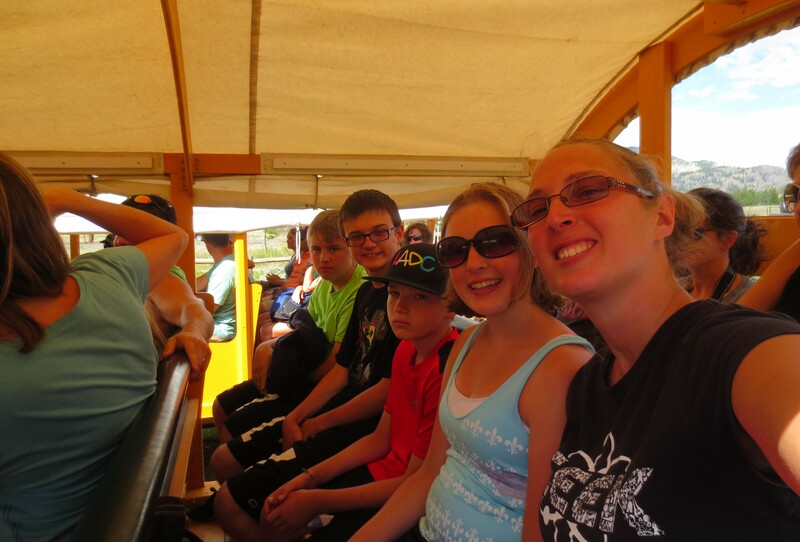 Some of the kids and I on the semi-covered wagon, heading out to the Cowboy Cookout. 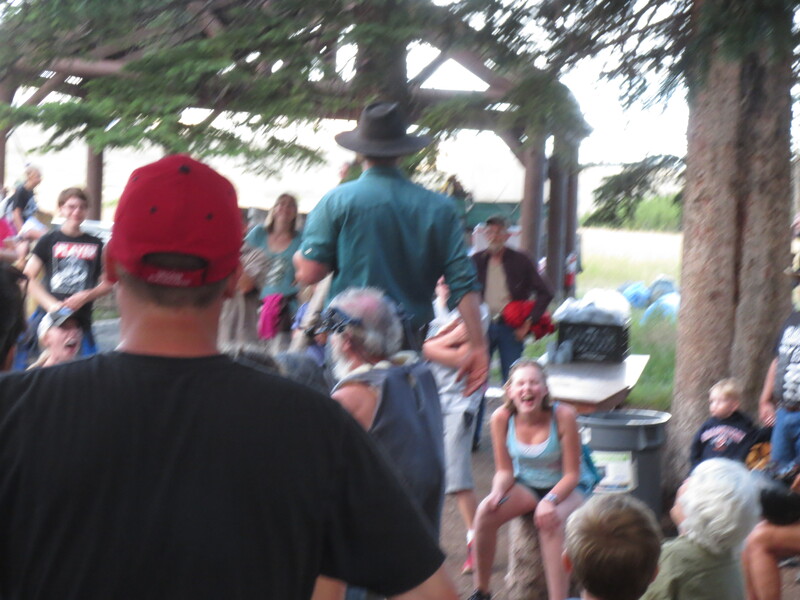 Our last evening in Yellowstone, we went to the Cowboy Cookout. There were two options available; we could either ride horses to the cookout, or take a wagon ride. A couple of the kids didn’t want to do the horseback rides, so we went on the wagon ride. It was a lot of fun! We got there plenty early to get checked in, go to the bathroom, etc. This was a good idea, since the line was quite long for the bathrooms. Then, we waited while they got all the horses hooked up, etc. One of the wranglers gave us some important info (such as “DON’T RUN!! It attracts bears”) that we needed to know before heading out. 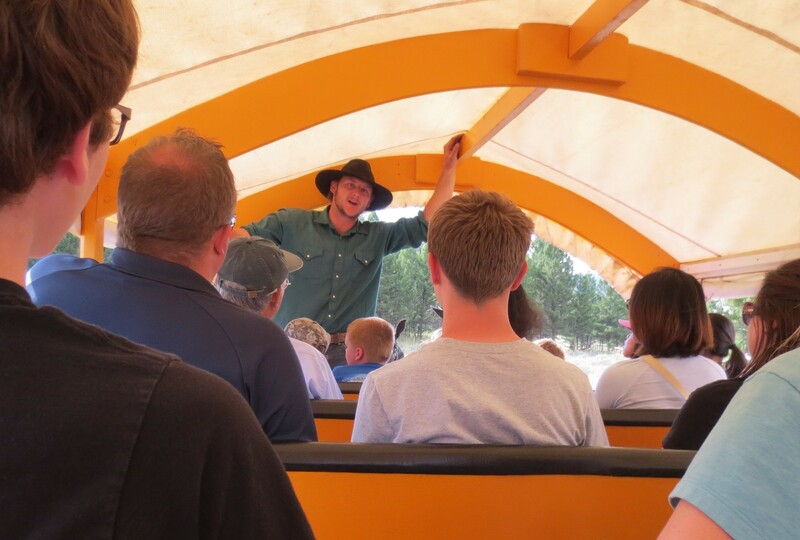 Then, they told us which wagons to go to, and we were off for a 25 minute or so wagon ride out to the cookout site. Our fantastic story-teller of a wrangler. Our wrangler was awesome! 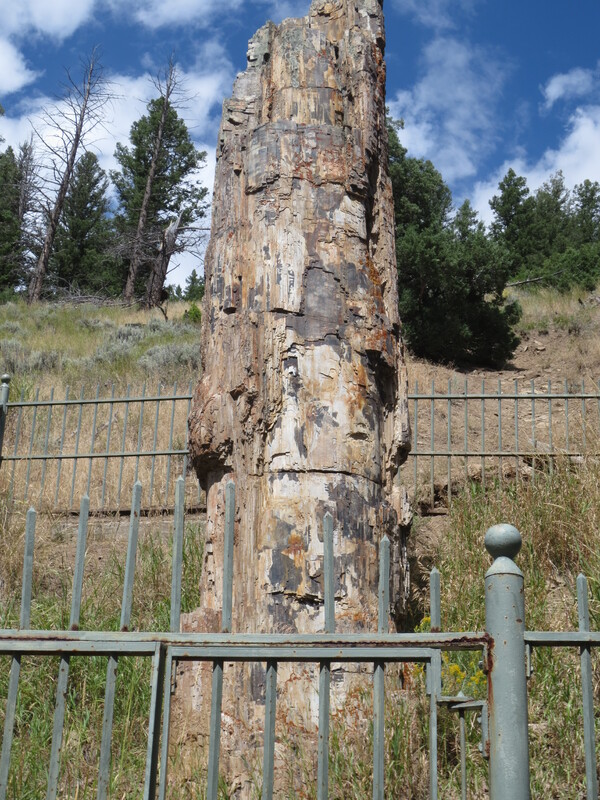 The whole way to the cookout, he entertained us/gave us a history lesson us with the story of Truman Everts, a man who was stranded in the park for 37 days, before Yellowstone was a National Park, or was fully explored. He got about halfway through the story on the way there, and finished on the way back. He was a great story-teller. So great, that after dinner on the cookout, he was telling “cowboy stories” around the campfire until it was time to go back. The cookout food was delicious! It was a buffet with steak and all sorts of side dishes. My favorite was the apple cobbler. YUM! After a week of eating sandwiches for lunch every day, it was a welcome meal, and oh, so good! There were several choices of pop, lemonade, and “cowboy coffee.” The coffee was made over the campfire. Not sure how they did it, or what was different, but it was my first real coffee all week, and it was good! I love that Grace is laughing so hard at this cowboy story! During dinner, there was a man and woman playing guitar, singing cowboy songs. After dinner, the entertainment moved around the huge fire pit, for more songs, and the cowboy stories I referred to earlier. Overall, this was a really fun time. The whole family enjoyed it. I would definitely go again, though, next time, I want to do the horseback ride! On the way to the cookout, we drove up Mt. Washburn. The road going up was treacherous. I was glad I wasn’t driving. I’m sure Jason wished I was! Despite the extremely poor road going up, it was a gorgeous view at the top. I’d say it was worth it! On the way back to our campsite, we saw the most amazing double rainbow any of us had ever seen. The entire sky was purple. The rainbow made a complete arc across the sky from end to end, with the brightest, most amazing colors ever! I kind of understand where the guy in that famous internet video was coming from… I think we all sounded about the same. It was a perfect way to end our awesome Yellowstone vacation! This picture does not do the beautiful rainbow justice, but it gives an idea.